In a blender or food processor, puree the tomatoes along with the onion, garlic and salt until thoroughly smooth. Pass through a strainer into a measuring cup and reserve. In another measuring cup, add enough chicken broth to make altogether 4 cups of liquid, but keep the 2 measuring cups separate. Heat the oil in a medium saucepan or casserole, over medium-high heat until hot but not smoking. Add the drained rice and cook, stirring often, until the rice becomes milky white and feels heavy in the pan as you stir, about 3 to 4 minutes. Pour in the strained tomato puree, mix gently and cook until the color of the puree darkens, thickens, and is mostly absorbed, about 3 to 4 more minutes. Stir in the pre-measured chicken broth and add the parsley, carrots, peas, corn and whole chile, if using. Bring to a rolling boil, reduce heat, add the prawns, squeeze the juice of half a lime all over if using, cover, and reduce heat to the lowest setting. Cook until most of the liquid has been absorbed, yet there is still some moisture in the pan. The rice should be cooked and tender; if not, but the liquid is totally absorbed, add a couple tablespoons of water, cover again, and continue to cook for a couple more minutes. Remove from the heat and let the rice rest, covered, for at least 5 minutes before you fluff with a fork and serve. I have people with seafood allergies in my home, can I substitute with chicken breast/thighs? I don’t have any fresh parsley on hand. Should I sub in something different or just omit it? Oh you can just omit it, Laura. This looks delicious, but my husband is allergic to shellfish. If I were to make the dish minus the prawns, would it still be tasty? Or can you suggest a substitute? Hope to try it (and the shredded flank steak with potatoes in green salsa) soon! Oh for sure! Or you can add any meat or extra veggies you want, Jen. I made this last night and the whole family LOVED it! So happy to hear that Nicole. Love all that you do. I make so many of your recipes and they always turn out great. This rice turned out “wet”. I followed the recipe exactly, but not sure where I went wrong. Any ideas? Cook it for a bit longer or…the shrimp may have exuded more water or maybe because of the climate of where you live or heat intensity of your burners you need 1/4 cup less water or so. Give it a try! And thanks so much for giving my recipes a try, Alex! Hi Pati! I love watching your show! Your recipes are so authentic yet simple that it makes me want to cook! I really want to try this recipe but it doesn’t say how long I should cook the prawn for toward the end as the rice finish cooking. 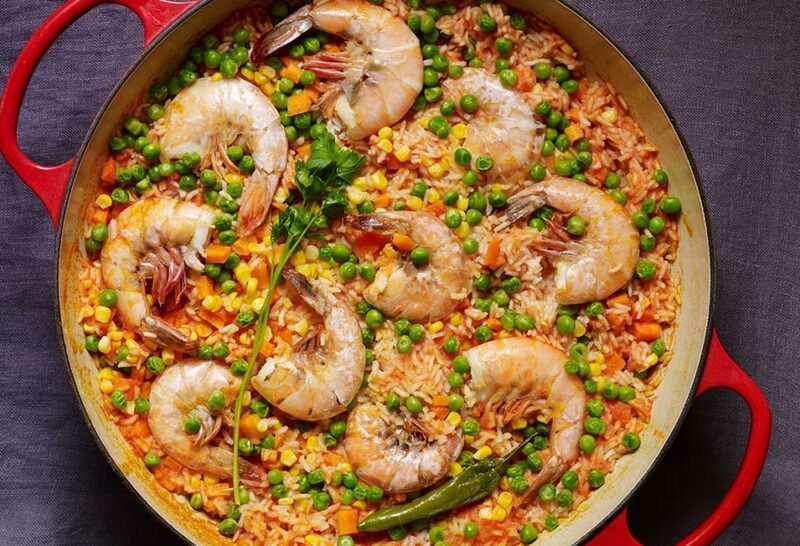 Do you have an estimate of how long I should cook the rice and prawns at a low heat setting? The prawns cook fairly fast. The key is to keep an eye of the liquid, once most of it has been absorbed and the rice has been cooked (and rested for 5 minutes) the prawns will be cooked! Muchisimas gracias pati por tu show. Nos estas muestrando como vivir una vida con tu pasion de cocinar. Yo soy el que cocina en mi hogar y mi esposa con nuestros dos barrones Carlos II, Christian Isaac, y bryanna nos encanta tus recetas. Mi favorita es el corn tort. Muy sabroso. Que Diosito lindo bendiga tu y tu fam. Con mucho respecto la familia Bravo. Hi Pati, My husband and I watch your show and thoroughly enjoy it. I would like to know what other dishes go well with this rice because I would live to make it but I lack imagination to create an entire meal surrounding this dish. Please help me out or if other readers have ideas, I welcome them also. You are pure joy to watch. Thank you so much for your fabulous cooking show. I’ve been watching season three on amazon prime. Pati, please tell me where you got your plates they’re so beautiful. I need them in my life lol they’re the grayish ones with brownish rims. I love them. Thank you for watching Denise! My dish collection is an eclectic mix of pieces I inherited from my mom, many things that we have gotten on trips to Mexico and many things from here, from all different places. Most of my plates and bowls are from a small town called Tlaquepaque. last day had this awesome treat..OMG guys it was one of the best dish I ever happen to have….. I made your Mexican Rice for my husband’s birthday. It was a HUGE hit! I am wondering, though, after putting the puree through the strainer, there was still about 1 cup of veggie solids left (it strained 1 cup liquid). Did I do this step right? Not wanting to waste this great flavor, how would you use up the 1 cup of vegetable bits? Thanks so much for making authentic Mexican food so accessible! Hola Rebecca, You can throw in some or all of the vegetable solids if you’d like. It’s more rustic that way! Hola Pati!Me llamo Nelly y por primera vez vi tu show esta semana y lo disfrute muchisimo! hoy mismo estoy preparando ese arroz que se ve delicioso, a ver como me sale. me gusto como hiciste el flan tambien. Gracias por compartir tus recetas…. I have literally tried like a bazillion times to make Mexican rice and it never turns out. Must try your version, it’s looks just like it does in the restaurants! Thanks for sharing!! Pati, so glad I set record when I saw your show on. Love watching you cook and on this episode the love between you and your dad!! You make everything look so easy, and what you cook is not complicated well most of it is not anyway. Thanks for expanding my recipe box and teaching me that making good Mexican food at home is not only good but also easy to accomplish with a few steps and good tips from a true mexican kitchen which I love learning from watching your shows!! Thanks so much. Melanie K.
Hi Melanie, Thank YOU so much!! Thank you! My spanish rice has never been quite right. Tons and tons of recipes … never a success, until now! I have finally figured out what I was doing wrong. Pati, I love you, and my stomach does too! No more mushy rice. So happy to hear this! Thank YOU!! Soy una mexicana que vive en la ciudad de Syracuse, NY, me encanta ver tu programa, yo no se cocinar, medio hago mis experimentos, el arroz ni de milagro me sale pero me gustaria tratar esta receta, lo que quiero preguntarte es donde puedo ver el video? Se me hace mas facil ver como lo preparas, muchisimas gracias…. ps… mi marido es americano y le encanta la cocina mexicana. ? Todavia no está el video en linea! Checa mi pagina de You Tube, también Pati Jinich, lo voy a tratar de subir pronto…. Saludos! Hi pati I love watching your show I’m Mexican & my wife is a Filipina I cook for her but I didn’t know how to cook Mexican food aside from tacos ,burritos but one day I was flipping the chanels & I found your show so I started cooking some of your recipes & we liked it a lot but definitly our favourite dish is Spanish rice with prawns(arroz rojo con camarones ) I don’t miss none of your shows thank you soo much now I know how to cook more than just tacos lol. Thank you for writing, Richard!! Thank you for tuning in! This rice recipe is amazing! I’ve made it a couple times now and it tastes wonderful every time! Thank you Pati! My thanks and raves to your wonderful recipes in this episode! What a delight to watch your shows…they always bring me happy thoughts of Mexico and how I long to be there! This one is Le Creuset, Gail. My pleasure and thanks for tuning in! Oh!!! I hope he likes it! The more you make, the better it will get! I love your show. The rice recipe sounds really delicious and will try it out today. Thank you, Pati for opening eyes that see Mexican food as consisting of only tacos, burritos, and enchildas. Gracias to you Eva, for tuning in! I have enjoyed seeing you on TV before but I saw your episode today of your new season and just loved it. I can’t wait to try all your recipes I viewed today! I enjoy Mexican food but have never been able to make anything that was authentic. But I think I can with your recipes. So glad you like the new season’s 1st episode! I hope you enjoy the rest of the episodes, we had so much fun making them and I absolutely love the food… Thanks for your message! I turned on my PBS station this morning and you were making the beef with green salsa, I stopped cleaning and sat down to watch. Yum! Well since I didn’t see it from the very start I had to look up your website. Needless to say cleaning day is done and I’m off to the grocery store to make your recipe for dinner. I have found my favorite website!! Thank you, thank you, thank YOU for writing me! I hope you enjoy all the recipes you try from my show and website.